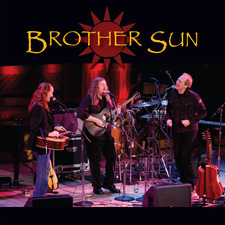 Pat Wictor, Joe Jencks, and Greg Greenway have formed the dynamic new trio called Brother Sun. Their harmonies are warm as a campfire, stirring as a gospel church, rousing as a call to arms. All three are contemporary songwriters steeped in gospel, blues, folk, and a touch of pop. With an energy that leaves audiences smiling and joining in, Brother Sun celebrates the amazing power of singing together. Nationally touring artists from three major points on the map - Boston, New York, and Chicago - Pat, Greg, and Joe combine years of touring experience. Their distinctive musical skills make for an unforgettable evening - three rich voices blending on a well-crafted foundation of guitar, slide guitar, bouzouki, and piano. "I just heard one of the best new songs of my life. The song is called "Trouble." Three magnificent, male voices---together. Gives me the chills---in the nicest way ever!" "......excellent music superbly performed.....The music of Brother Sun gives us courage to strive for a better world and to make more of our own lives. Thank you for that." "...a really good sounding cd - both for the ears and the heart."